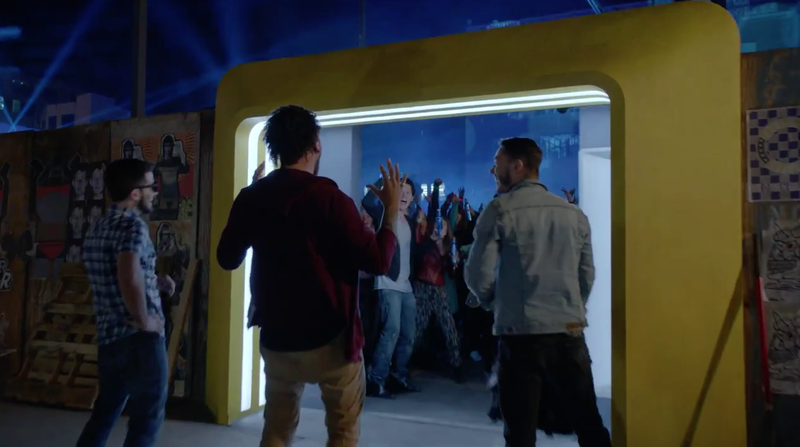 Bud Light on Friday released the 15-second teaser below for its upcoming 60-second Super Bowl commercial, in which—as promised—a man accepts a challenge to play a crazy, life-size game of Pac-Man. As seen in the teaser, the dare is written on the label of his Bud Light bottle. That ties into a new Anheuser-Busch packaging campaign that began in December, in which Bud Light bottles now come with almost 50 different "Up for Whatever" messages to inspire drinkers to be more spontaneous and fun. In the full 60-second Super Bowl spot, titled "Coin," from EnergyBBDO, the man follows the hint on his bottle and "finds himself in a giant Pac-Man maze, having the time of his life," says the brand. The work builds on Bud Light's buzzy 2014 Super Bowl campaign "Epic Night," which starred Arnold Schwarzenegger and Don Cheadle and took the brand away from its usual scripted jokes and into dynamic real-life stunts. This year's campaign will be supported by a three-day House of Whatever event in Arizona, near the site of the Super Bowl. In addition to the Bud Light spot, A-B plans to air two 60-second Budweiser ads (one of them a sequel to last year's chart-topping "Puppy Love") on the Feb. 1 Super Bowl telecast.